The gasifier is on the right side. The ports on the side of the barrel are, upper - air inlet and the lower one is the ignition port. The producer gas is pulled off the unit in the back in the top, about level with the upper ring on the green barrel. The gas then flows into the upper tube which is a water cooled moisture condenser, the gas then flow down into the middle tube which is the same as the upper tube. Then into the lower tube which is simply an air cooled pipe to remove more of the moisture. The suction is provided by a high end vacuum cleaner type blower which is under the white pail on the left side. The producer gas is then blown up into the burner. This burner works well, the gas is blown in the side and swirls around, air enters the end of the burner and mixes with the producer gas and is ignited by a ceramic igniter like in a clothes drier or natural gas oven. This works great. The flames are then sucked into the galvanized tank which has seven 2.5" steel tubes running the length of it. The hot gases exit the right end of the tank and across a heat core salvaged for a car. There is a squirrel cage fan on the far right end of the system which draws the hot air through the tubes and across the heater core and then it will eventually be connected to a stack to get the exhaust above the house. Here is a shot of the internals of the gasifier. The unit is upside down. The rusty part is the part that holds the unburned wood scraps, The air manifold is towards the bottom of the tank. The fire hearth is the bottom of the barrel with the fire box below that. The fire box is made from fire bricks with a grate on the bottom. The four legs hold the unit off the bottom of the barrel to allow room for the ashes. Here is the inside of the gasifier. The throat is about 2" in diameter, there are 12 nozzles with a 1/4" id. They are about 5" above the throat. 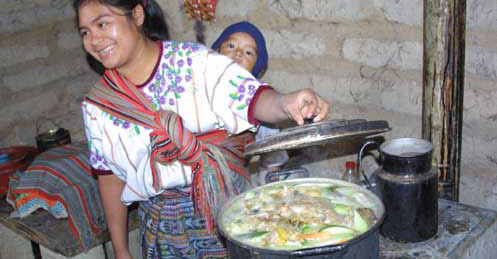 The bottom of the tank is the only cone that directs the charcoal down to the throat. 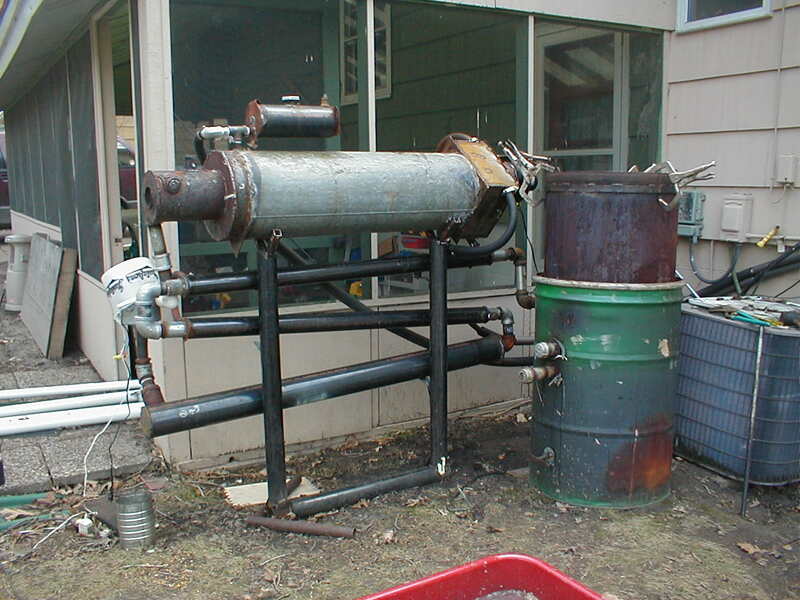 I am interested in converting this system gasifier to burn wood chips, here is a picture of the proposed fuel. The chips from ground up trees that the city places in piles around the Minneapolis, Minnesota city. I talked with the person in charge of the project and she stated during the winter months the chips are fairly dry because there are no leaves and the sap goes into the roots during the winter months. Next winter I am planning on producing electricity. I haven't the time to get the whole system up and working this year. My main goal is heating my house. Any advice regarding modifications and auger supply systems that others have sucesfully used would be of great help. The burner produces about 90,000 BTU/hr. of hot water.